With a highly evolved circulatory system, albacore are able to swim great distances and reach speeds of up to 50 miles per hour. 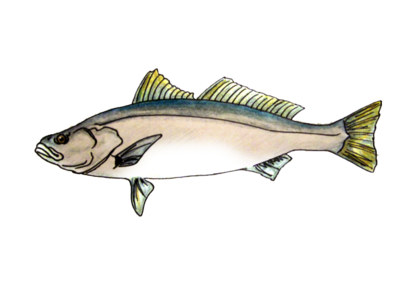 Albacore is an abundant species and a particularly healthy fishery in the Pacific Ocean. The fishing season for this species begins mid-summer and can run through the early fall. 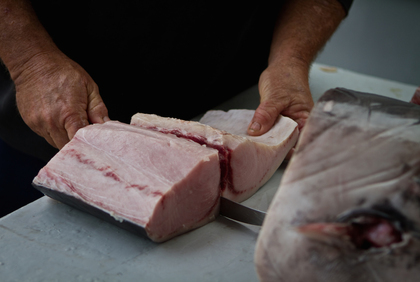 Albacore are landed in northern California, Oregon, Washington and into British Columbia as well. Culinary Tips: Highly versatile: Can be enjoyed raw, grilled, or smoked. Catch Method: Longline or Trolling. 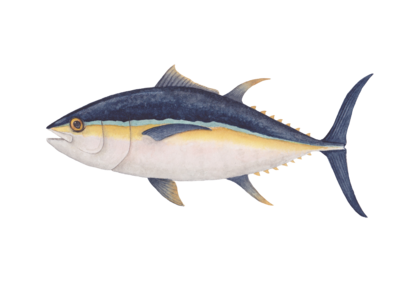 Sustainability: Albacore stocks are considered healthy in the Pacific Ocean and the fishery produces relatively low bycatch compared to other tuna species. U.S. tuna fisheries overall are more sustainable than those in other countries because of the tougher regulations and effective monitoring systems we enjoy. Bigeye Tuna get their name because one of the only ways to identify them from their very close cousin the Yellowfin Tuna, is by their large eyes. 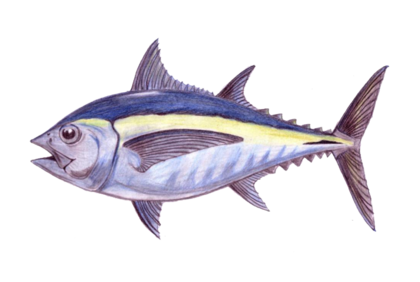 Both Bigeye and Yellowfin are sometimes referred to as the Hawaiin name "Ahi" in the marketplace. 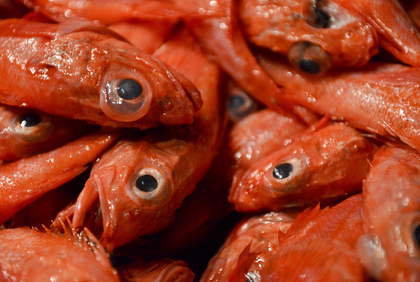 Culinary Tips: Bigeye is fantastic raw. 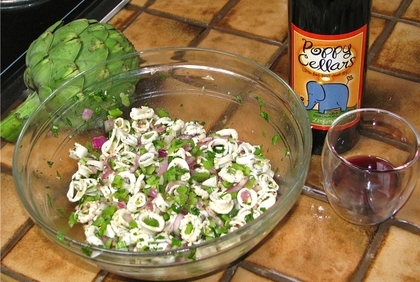 It can also be seared quickly on the grill or poached in olive oil for the foundation of an amazing tuna salad. Sustainability: Bigeye Tuna are no longer overfished in the central and eastern Pacific Ocean (Seafood Watch). The primary concern for longline tuna fisheries is bycatch of sensitive marine species and migratory seabirds, but the US has the toughest regulations for longliners and the gear used by this fleet to catch Bigeye is designed to minimize bycatch as much as possible. Black cod, also known as sablefish or butterfish due to its velvety texture, which results from a rich content of healthy oils and omega-3 fatty acids. 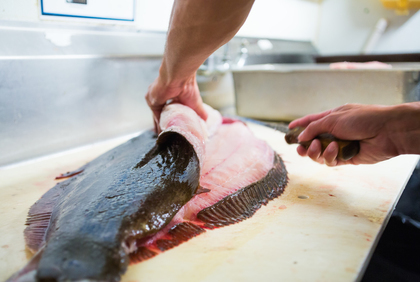 Most Black cod is shipped to Japan, where their seafood loving culture snaps it up. 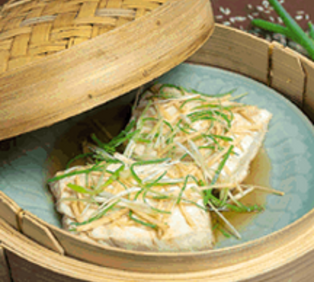 It’s becoming more prevalent here, as Japanese chefs have introduced it to Americans, most often as Miso-Glazed Black Cod or simmered in a Japanese style broth. Culinary Tips: Because of its cold water habitat Black cod is packed with healthy oils which protect it from over-cooking and keeps the fish moist. We recommend baking, roasting, or grilling it with big flavors. It is also fantastic when smoked - try our Good Food Award-winning Carmel Canyon Smoked Black Cod! Catch Method: Bottom trawl, bottom longlines, and pots. Sustainability: The sablefish population off the California coast is extremely healthy at 96% of its target level and is harvested at sustainable rates (NOAA FishWatch). 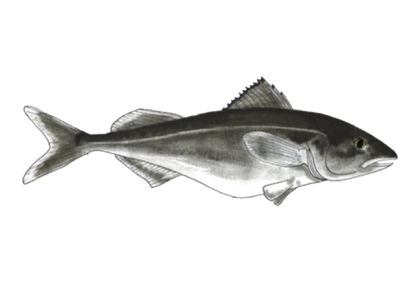 Black Cod in California is is part of the California Groundfish Collective which is particularly effective at collecting data and designing sustainable management strategies. The name cabezon literally means “big headed” or "stubborn" in Spanish. And big headed it is, so much that this fish has the capacity of swallowing small abalone and regurgitating the shells. This scaleless fish has a frightening appearance, with 11 spines on its dorsal fin, a spine before the eye, and an rear spine of soft rays. Cabezon can reach up to 25 pounds in weight, and while most males are reddish in color, females are usually greenish. Culinary Tips: Cabezon has a mild flavor and color similar to rockfish, but a denser texture more like salmon when cooked. For this reason you can cook cabezon any way you like, it can even hold up on the grill compared to other groundfish. Sustainability: Cabezon represents a small fishery in California, so we could benefit from more data on the species. But the fishing methods create minimal bycatch or habitat effects, and fisheries scientists believe the population is "likely healthy", so we considerate a sustainable species. 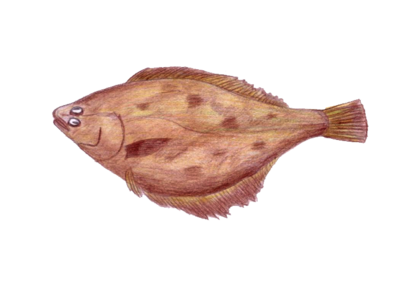 This bottom-dwelling flatfish is native to the waters off central and southern California, can weigh up to 50 pounds, and is loved by sport fishermen since it can occasionally be caught from shore or by kayak in shallow waters. It is actually more closely related to a flounder rather than the Pacific halibut which resides in waters farther north along the west coast. California halibut is caught year-round, but it is most commonly landed in the summer and early fall. 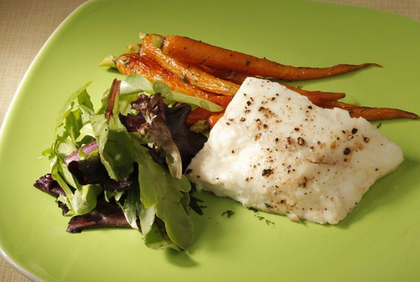 Culinary Tips: There is no wrong way to prepare California halibut. It is delicate enough steam or shallow poach, but is also one of the only flatfish robust enough to handle the grill too. It can also be prepared raw for any recipe calling for fluke, flounder or the Japanese translation - "hirame". Sustainability: Landings of California halibut have stayed consistent in recent years which indicates that populations are not being depleted. The catch methods do not generate significant amounts of bycatch, and the management by the California Department of Fish and Game is effective and keeps fishermen accountable. The California spiny lobster ranges from Monterey Bay to the Gulf of Tehuantepec, Mexico. They are rarely found north of San Luis Obispo Bay, as the water here is usually too cold to allow for breeding. 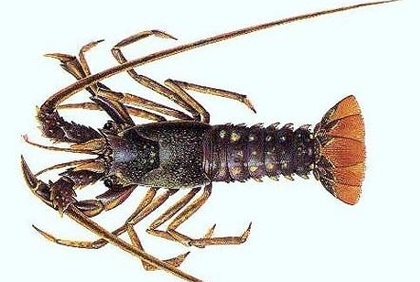 They have no claws, unlike their east coast cousins the American lobster, native to the North Atlantic. Spawning takes place from May to August, and the commercial fishery, which runs from the first Wednesday in October to the first Wednesday after March 15, is timed to avoid spawning season. Culinary Tips: Like most crustaceans, spiny lobsters are best cooked alive, so we offer them pre-cooked on special sales a few times during the year. Crack and eat as is, or use them for any preparation that calls for crab. Catch Method: Traps aka "pots"
Sustainability: California spiny lobsters are caught with traps that have little bycatch and have low environmental impact. This species supports a popular recreational fishery too, so managers are conservative when seeting the total allowable catch. 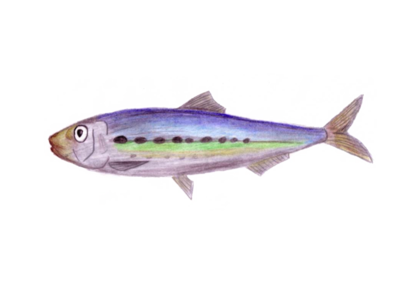 Pacific Jack Mackerel, also called horse mackerel, are streamlined fish with blue or green on its back and silvery coloring below. The habitat ranges all along the Pacific Coast of North America, from Alaska to Baja California. Typically they are 12-18 inches in length, but some can get as large as 3 feet. This species offers nearly as much omega-3 fats per serving as salmon, making it rich and perfect for any recipe calling for tuna or salmon. Jack mackerel is popular in Japan and any sushi restaurant that can get a hold of it, but it has not yet generated a large following in California restaurants. 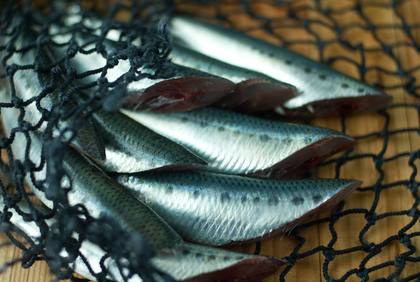 Culinary Tips: Jack mackerel is fantastic in raw preparations when it's fresh. 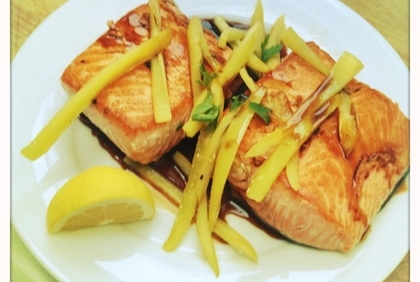 It is also fantastic on the grill, and can be subbed for any recipe that calls for salmon, tuna or yellowtail. Sustainability: This species is mostly seen as bycatch for other fisheries, typically salmon or albacore vessels, both of which are operating in well-monitored, sustainable fisheries. We always aim to support our fishermen by buying their bycatch. The best available science on this species does not indicate overfishing is occuring. 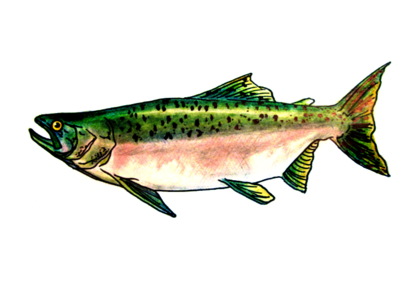 Also known as Chinook salmon, the King Salmon is the largest salmon species in the Pacific. 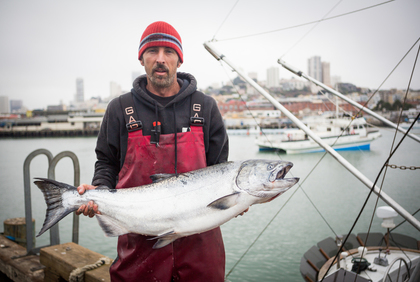 They are popular in the kitchen of course, but they are also prized by sport fish from California to Alaska. Like all salmon species king salmon are anadromous, meaning they are born in fresh water, migrate to salt water to live most of their lives, then they return to their natal stream to spawn and die. Each spring this annual king salmon return begins in California, running through to mid-summer. The commerical king salmon season begins and ends with this migration. 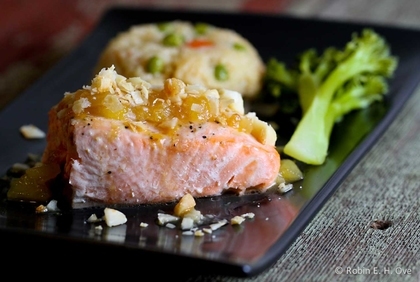 Culinary Tips: King salmon is the richest most decadent species of Pacific salmon and can be cooked any way you can imagine. It is fanstatic prepared on a cedar plank on the grill, roasted with seasonal vegetables in the oven, or even smoked or cured. Sustainability: Some salmon populations along the California coast are endangered or threatened, so the chinook salmon that is allowed to be caught is highly monitored and done so as sustainably as possible. Troll gear is extremely selective and produces very little bycatch and no harm to the marine habitat. Dungeness crabs molt, or shed their shells, between May and August and mating occurs immediately after the female has molted and before the new exoskeleton hardens. A chivalrous crustacean, the male Dungeness crab embraces the female for several days before mating. The commerical season runs from late fall through the early summer, pausing in the warmest months to avoid this sensitive spawning period. 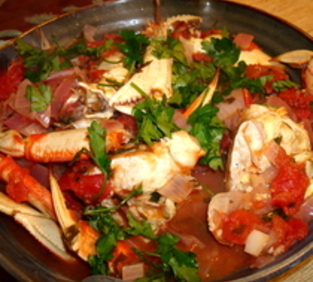 Cooking Tips: Crab cakes, cioppino, and crab ravioli are all perfect with Dungeness crab. 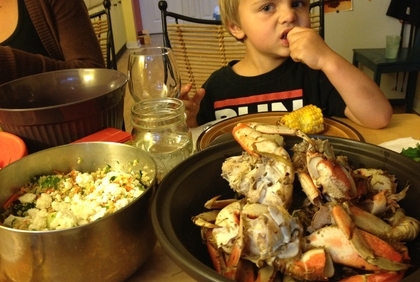 We deliver crab pre-cooked so it is ready to eat right when you get it. 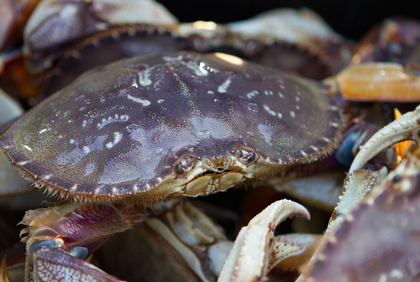 Sustainability: Dungeness crab populations on the West Coast are stable and the fishery is extremely well-managed. 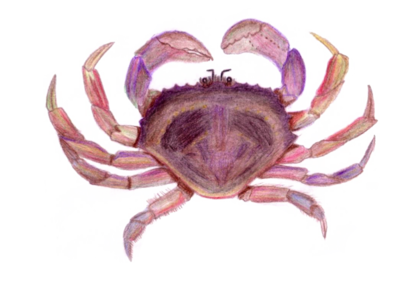 Fishing seasons are scheduled to avoid crabs’ primary molting season, and size regulations ensure that female and undersized crabs are not retained and allowed to mate. 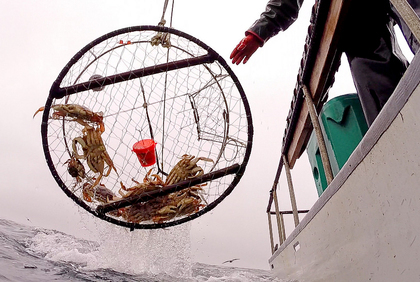 Also, crab traps have very low amounts of bycatch. 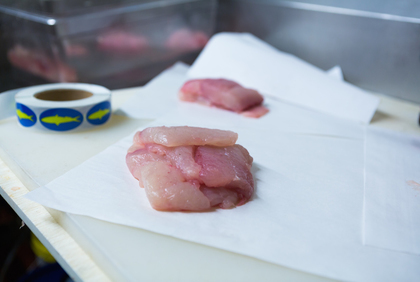 Prior to cooking, the lingcod’s flesh can sometimes appear bright blue or green, making it a distinctive species at your local fish monger. And after cooking, they'll turn white. Lingcod is nicknamed buckethead, and is native to the North American Pacific coast but is neither ling nor cod. Its name originated because it somewhat resembles those fish. Lingcod also support a popular recreational fishery. Culinary Tips: Lingcod is a lean, white fleshed fish that has a mild flavor and cooks to a medium-firm texture with a nice flake. 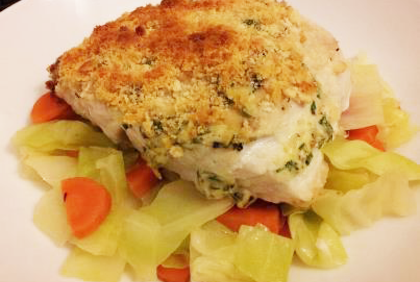 It can be substituted for any recipe calling for rockfish or halibut. Sustainability: Biomass off the US West Coast is high. They have very high reproduction rates. 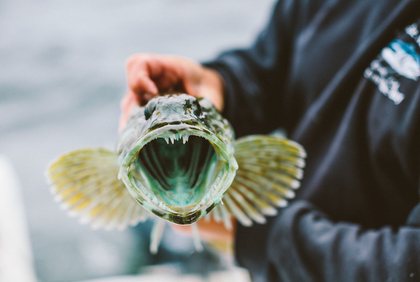 Lingcod are caught with gear that have little impact on habitats and very low accidental catch. Management is strong, with seasonal closures during spawning season. 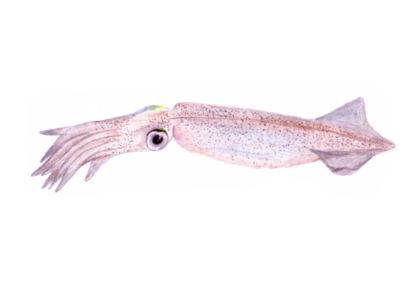 Market squid are native to the Eastern Pacific Ocean and due to their short life span, reproduce at a young age, making them highly resilient to the pressures of fishing. Humans are not the only ones to find market squid delicious – they are a primary food source for sharks, carnivorous fish, seabirds, and marine mammals such as seals and sea lions. In Monterey Bay, the market squid fishery has existed for nearly 150 years, originally begun by Chinese immigrants and later taken up by Italian immigrants. 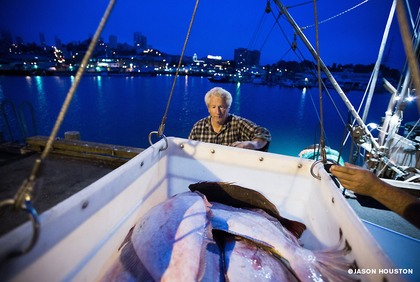 Within Monterey Bay, the fishery typically operates from April to November. Culinary Tips: Fresh squid cooks quickly making it perfect for a stir fry or fried after being lightly breaded. The bodies or "tubes" are also great when stuffed and gently baked in a tomato sauce. Sustainability: On the West Coast they are plentiful and highly regulated. Market squid are a fast-growing species with a short natural lifespan, which makes them less susceptible to overfishing. By encircling schools of squid with nets, bycatch from squid purse seining is generally low. 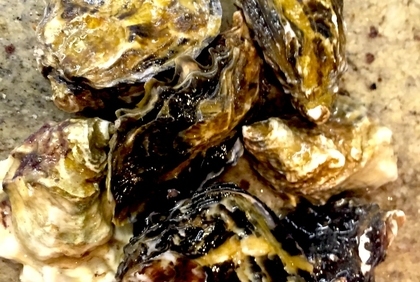 Miyagi oysters (aka Japanese oysters or Pacific oysters) are the most widely farmed oysters in the world, since they are easy to grow and adapt to new environments easily. 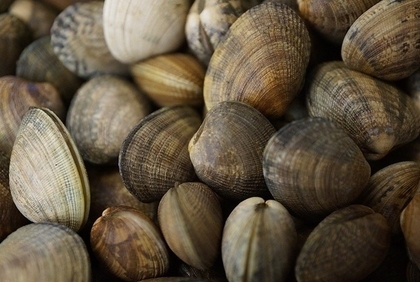 These marvelous mollusks can each clean up to 50 gallons of water a day! For this reason, oysters of any kind are one of the most sustainable seafood choices on the market. 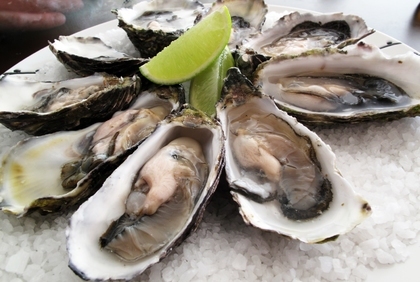 Our local oysters usually come from Tomales Bay and Morro Bay. They are available year-round, but the flavors are at their peak in the colder months. Culinary Tips: Raw Miyagi oysters have a briny flavor with a sweet, cucumber finish and are perfect with your favorite raw bar condiments. 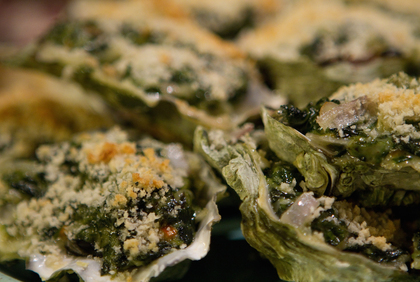 They're also fantastic grilled or broiled in the shell with a compound butter. 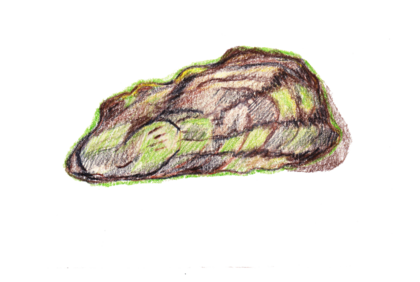 Sustainability: Oysters are as sustainable as sustainable gets. They filter and clean our waterways, they provide important habitat for juvenile fish, and they buffer our coastline from storm surge and waves. In Monterey Bay anchovies are a key building block in the California marine food web, feeding everything from whales to seabirds. Today most commercially caught anchovies are reduced to pellets, processed into fish oil, or frozen into blocks and shipped overseas to be made into industrial animal feed. Anchovies are extremely high in omega 3s, niacin, vitamin A, potassium, calcium and selenium, making them one of the healthiest foods in the ocean. 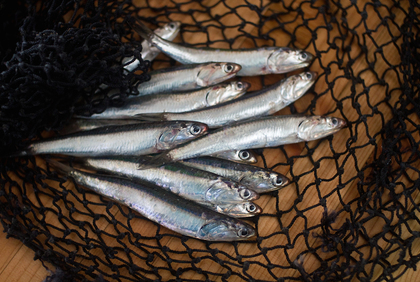 We offer them fresh on occasiaon when they land still alive in Moss Landing, and we offer Monterey Bay Anchovy Boquerones in our Member Store as often as possible. 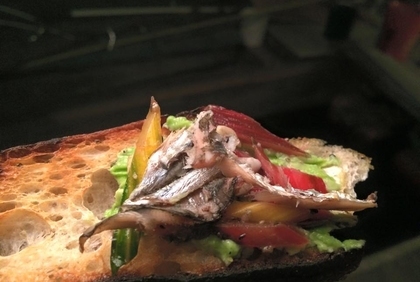 Culinary Tips: Fresh anchovies are much milder in flavor than canned or cured and are fantastic roasted or fried whole. We also sell cured anchovy products like boquerones which are perfect for sauces and salad dressings. 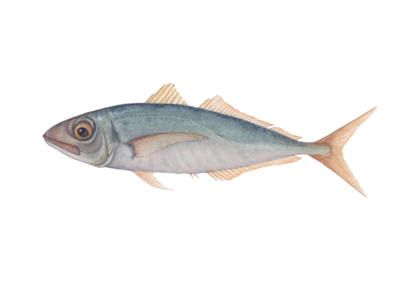 Sustainability: Formal stock assessments are not conducted for either the northern or central subpopulations of anchovies, but data is collected to help monitor the populations, and populations are currently thought to be abundant. (NOAA). 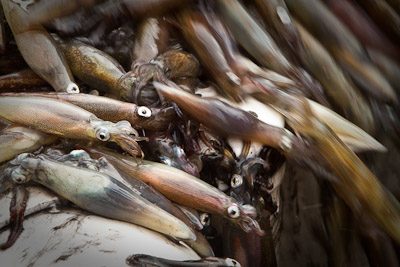 The gear used to catch anchovies in California is used at the surface and has little impact on marine habitats. 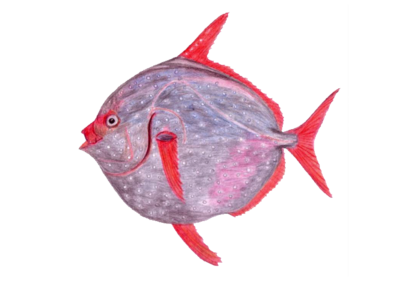 Also called moonfish, this colorful and large species is one of only two living species in the Genus Lampris. They live in deep tropical and temperate waters around the world and can easily weigh over 200lbs. Opah are often found swimming with schools of Bigeye Tuna in the eastern Pacific Ocean, which is why we usually see them as bycatch from Tuna boats. 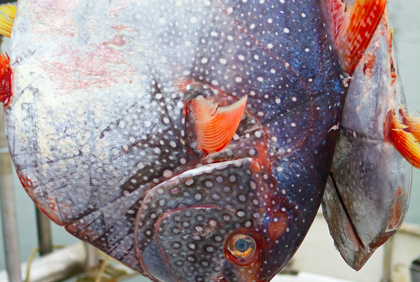 Opah has recently become popular in seafood restaurants but is still relatively unknown outside of Hawaii and southern California. They have three distinct types of flesh that all appear different and cook differently too. 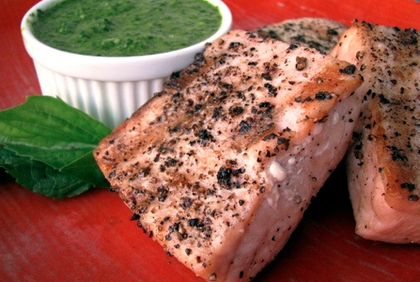 Culinary Tips: Opah is one of the most versatile species on earth, not just in the sea! 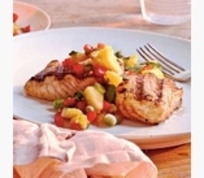 The salmon-colored top loin is firm and lean and is best grilled or seared. 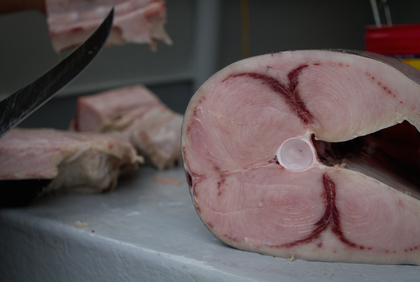 The belly which is a lighter orange/pink color is fantastic for raw preparations, or even for smoking or curing. The deep, red, beef-like abductor muscle (usually called the "cheek") is like a lean, tender flank steak and should be prepared as such. 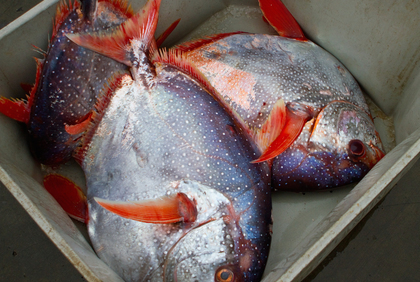 Sustainability: Since Opah is usually a bycatch species from well-managed Tuna fisheries, we are eager to sell it and provide those fishermen more value for their trip. The management of this fleet is rated as "highly effective" and the longlines used to catch Opah are designed to minimize bycatch as much as possible (Seafood Watch). 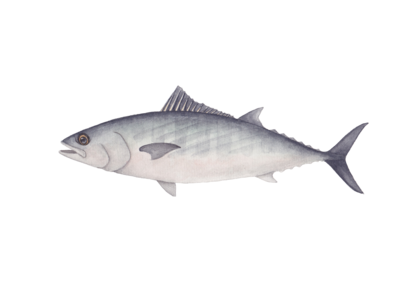 Pacific Bonito aka Skipjack Tuna are a relatively small tuna from the same family as albacore (Scombridae). They have beautiful dark blue coloring on top that fades to silver on their underbelly, and are easily identified by dark slanted bands along their sides. Fast growing, Pacific bonito often weigh 3 pounds within a year of hatching. Their rapid growth and extremely efficient body shape give them speed and strength, which makes them popular among fishermen. Culinary Tips: Bonito can be plugged in for any tuna recipe you find, so it is great poached, seared, grilled or served raw. It holds up well to heavy seasoning and big flavors. 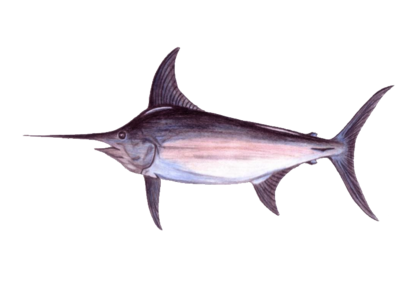 Sustainability: Pacific Bonito are a highly migratory species, and reproduce rapidly and frequently throughout their range. They are managed at the state, national, and international levels, but ours are typically caught on short trips near the California coast. Bycatch is minimal with the type of fishing gear our fishing partners use for this species. 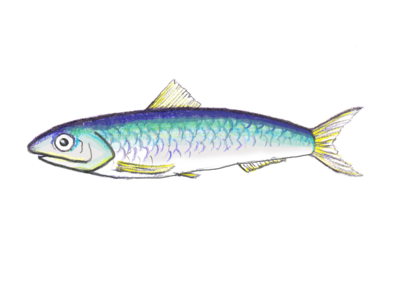 Pacific herring is a keystone species in coastal California marine ecosystems. That means that herring have a disproportionately large effect over their environment relative to their abundance because they are an important prey species and an important predator. Interestingly, most herring are not caught for their flesh, but rather over 90% are caught for their roe (the eggs inside of them) that is exported to Japan. Japanese traditionally eat herring roe, or kazunoko, at the start of a new year because it symbolizes prosperity. To fill their demand for it, the Japanese turned to the United States and set off a "silver rush" in San Francisco and Tomales Bays that led to fishing limits on Pacific herring in 1973. Culinary Tips: Pacific herring are fantastic when cured, pickeld or smoked, as is typical in northern European countries that love herring. 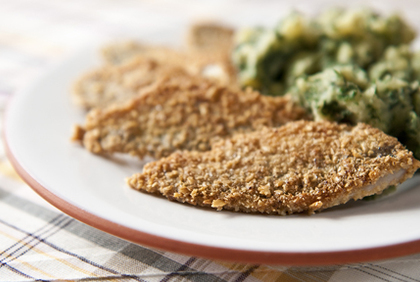 Another great preparation is to coat the fillets in flour, shallow fry them, and serve with a lemon wedge. 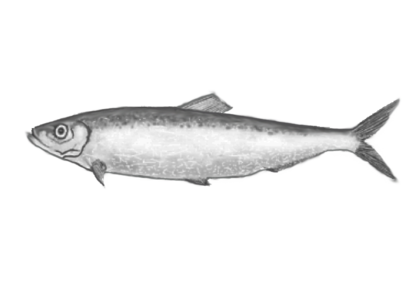 Sustainability: The Pacific herring stock in California is rebuilding after a period of low abundance in 2008-2009 so management is very careful on this species. The location and time of fishing is careful to avoid bycatch or habitat disruption. Pacific sardines are found in both offshore and nearshore areas along the coast, with locations of schools largely dictated by water temperatures. Sardines migrate regularly, with spawning concentrated in southern California and feeding concentrated in the central and northern waters of the state. In Monterey Bay, sardines may spawn year round, with peaks generally occurring between April and August. Migrations, or “sardine runs,” attract many predators, such as larger fish, marine mammals, and seabirds, often creating feeding frenzies. 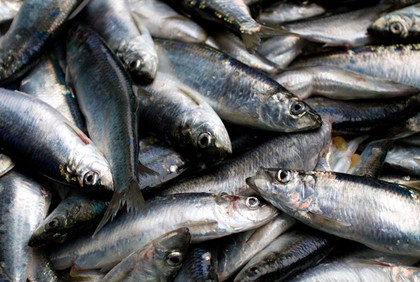 Culinary Tips: Fresh sardines are much different than canned, and are best prepared the same day you receive them. 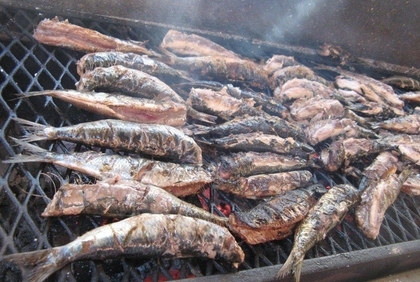 California sardines are fantastic on the grill, cooked whole with olive oil, salt and lemon. They can also be filleted and cured with those same ingredients and served raw. Sustainability: The California pacific sardine biomass fell below an important threshold in 2015 and has since been closed. This is mostly due to the natural fluctuation that forage fish species like sardines experience, and likely not due to overfishing. On the rare occasions when we do source pacific sardines, it is only when we get them as part of allotted bycatch from sustainable market squid and northern anchovy fisheries. 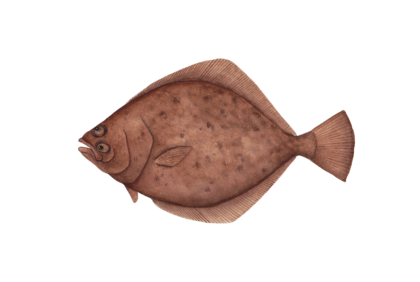 Petrale sole, like halibut and flounder, is a flatfish with mild, white flesh whose habitat ranges from Alaska to Baja California. They stay small, only reaching about two feet in length at maximum, and usually live at depths between 330 and 500 feet deep. In California they are often landed with Rockfish and other bottom-dwelling species. Petrale land year-round, but they are best in the winter months. 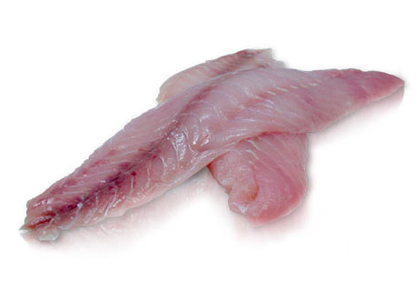 Culinary Tips: Petrale sole is reltively firm compared to other flatfish, but it's still a delicate, mild species. 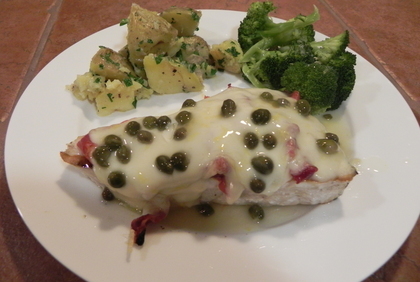 It is best cooked gently in the oven, poached, steamed, or over a medium flame in a non-stick pan for sole meuniere. 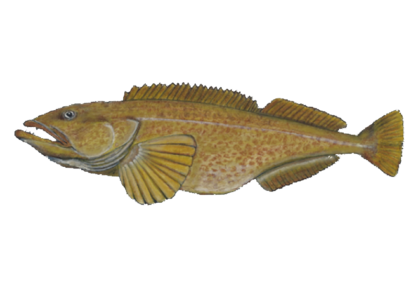 Sustainability: Petrale sole is part of the U.S. West Coast Groundfish Fishery, which includes very effective management. Even though bottom trawling is capable of damaging marine habitat, closed fishing areas and gear modifications are in place to minize those effects. Much of this fishery is also Marine Stewardship Council certified. 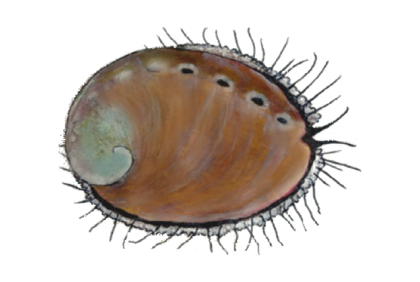 Abalone have shells, but they are not technically shellfish. They are actually mollusks, more closely related to scallops, sea slugs, octopuses and squid. In some countries they are called sea snails. 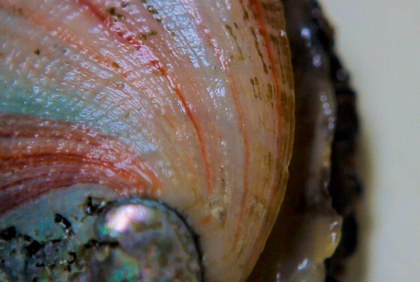 Besides their delicious flavor, abalone are known for the beautiful colors of the inside of their shells. Large algae, such as the giant kelp found in Monterey Bay, are the preferred food of abalone, and this is why they grow so well in our local waters. They have many wild predators, including the beloved southern sea otter. Culinary Tips: Red Abalone is more closely related to squid and octopus than to muscles or clams, so its flavor is sweet, mild with a tender texture, similar to those species. It can be battered and fried, seared, or gently cooked in butter. 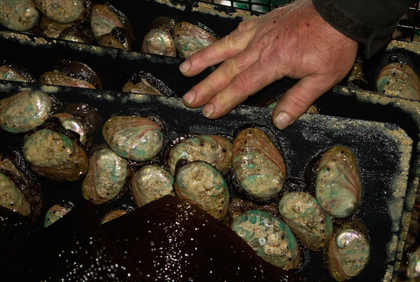 Sustainability: Wild abalone harvest for commercial sale in California is illegal due to dwindling populations. Our abalone offerings are farm raised in closed on-shore systems that minimize waste output and do not interact with the marine environment. 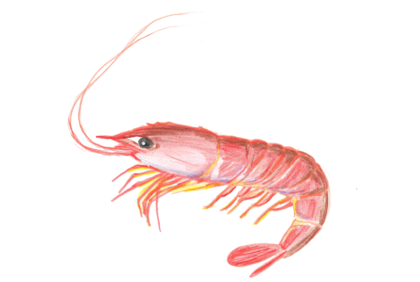 The ridgeback prawn gets its name from its hard shell. It is the only species of rock shrimp along the U.S. west coast. They are broadcast spawners, sending their eggs into the open ocean, as opposed to other shrimp that carry their fertilized eggs with them until they hatch. Females produce about 86,000 eggs on average during the spawning season of June through October. Having a high fertility rate is important for a species that is enjoyed by lingcod, halibut, sharks, rays, octopus, and humans alike. Cooking Tips: Whatever you do, be sure to eat them fresh or remove the head and freeze right away, since they are highly perishable. They are fantastic for raw preparations, or quickly cooked for a pasta dish. 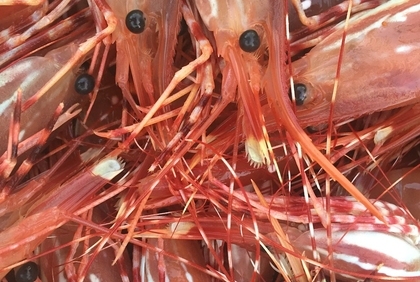 Sustainability: This fishery was overfished in the 1990's and we can understand why Seafood Watch would be cautious, but we feel that our ridgeback shrimp fishing partners are operating sustainably. Fishermen are reporting very little bycatch this season so far, and they are using gear modifications and fishing in sandy bottom areas to avoid harming the seafloor. The fishery is closed from June-September to protect spawning females, and in general management is strict because of the history in this fishery. Only about 11 permit holders actually fished for ridgebacks last year. Also known as the Pacific or California rock crab, this nocturnal crab has eleven teeth to either side of the eyestalks. It is found at depths of no more than 300 feet, but usually around 150 feet deep. Their habitat of choice is low rocky intertidal areas, where they bury under rocks or in kelp beds. They are great scavengers, relying primarily on small bits and pieces from small fish and hermit crabs, which they capture by gradually chipping away at the edges of their shells until the hermit crab has nowhere else to go. 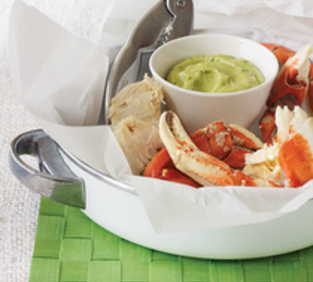 Culinary Tips: Rock crab don't have much meat in their bodies, but they have large claws that are typically pre-cooked and sold on their own as a perfect appetizer or a beautiful addition to a seafood tower. 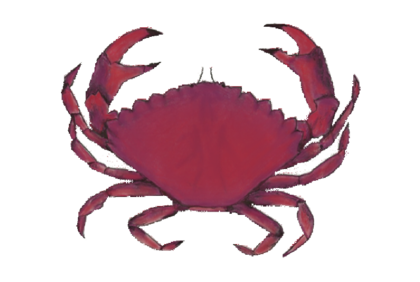 Sustainability: Rock crab are a less targeted species off the Central Coast due to the prevalence of larger Dungeness crab, so fishing pressure is generally lower. Traps use to catch rock crab do not disturb habitat and have very low bycatch. There are more than seventy rockfish species native to the Pacific coast of the U.S. and we offer as many varities as we can find. Chilipepper Rockfish, Blackgill Rockfish, Boccaccio Rockfish, Splitnose Rockfish, Vermillion Rockfish, Gopher Rockfish are a few of our favorites. 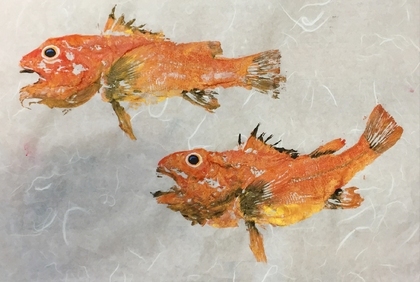 "Rock Cod" or "Pacific Snapper" are other local nicknames for rockfish species. The southern half of the California coast has the most rockfish diversity anywhere, with at least 56 different species known. Rockfish earned their name because they are bottom-dwelling species that prefer rocky areas. Fish species in this genus have some of the longest lifespans of any fish on earth, and some have been recorded to live up to 205 years. These long life-spans made it difficult for some species to absorb industrial fishing pressures that peaked in the 1980's and '90's, and many rockfish species became overfished. 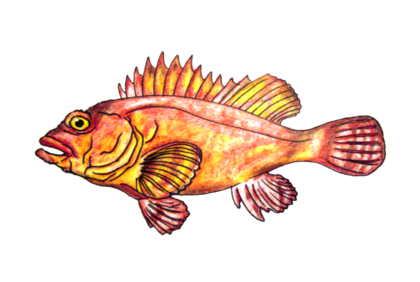 Today though, Pacific groundfish populations like rockfish have largely recovered due to strict management and responsible fishermen. Culinary Tips: All rockfish species have a mild flavor, cook to a medium firmness, and flake nicely. 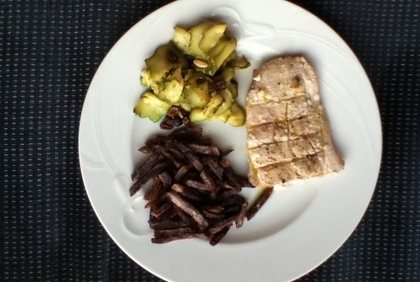 Larger fillets can be dredged in flour and pan fried, while smaller rockfish are delicous cooked whole. 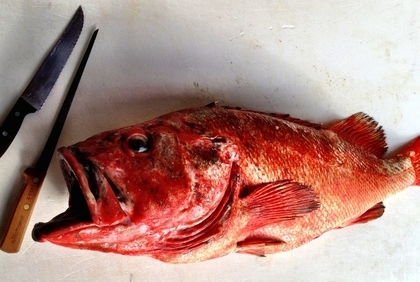 Rockfish is also sometimes served raw in a ceviche. 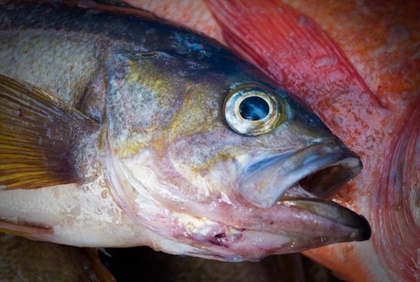 Sustainability: Rockfish fisheries are highly regulated under both state and federal laws. In federal waters, the rockfish trawl fishery is part of the Catch Shares program, with 100% observer coverage. Hook and line caught rockfish has very low bycatch rates. 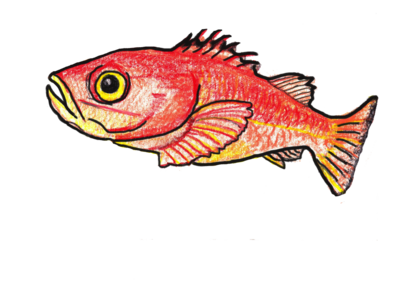 A growing number of Pacific rockfish fisheries on the west coast are becoming Marine Stewardship Council certified for sustainability. Native to the northern Pacific, this flatfish has the ability to change its color and pattern to match its surroundings, making it virtually invisible to predators. Pacific Sand Dabs are a local delicacy and have in and out of vogue over the years in California restaurants. They feed on shellfish, squid and octopus, making them one of the sweetest and tastiest fish available. 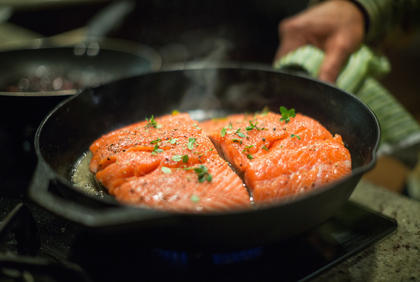 Culinary Tips: We recommend a quick cooking method and light flavor pairings. They are best when fried on the bone (aka "Pan Ready") or as fillets. Sustainability: Consistent landings indicate that populations are stable. Hook and line and trap fishing has minimal bycatch with the ability to throw back juvenile fish. Bottom trawling for sanddabs is highly regulated under the catch shares program, which has reduced fishing pressure. 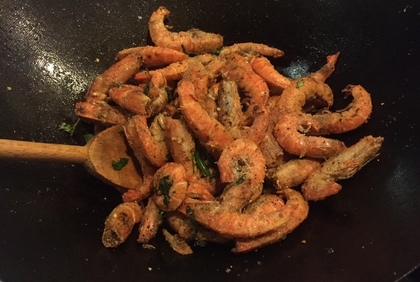 Spot prawns are a large species of shrimp that sell for high prices and typically land in southern California. They are sold live whenever possible, or quickly frozen, since they have an enzyme in their shell which will deteriorate the flesh quickly after they die. The fishery originated by accident in the early 1930's in Monterey when they were caught incidentally in octopus traps. The season runs from November - February typically, but in practice it only lasts for a few weeks due to conservative catch limits. 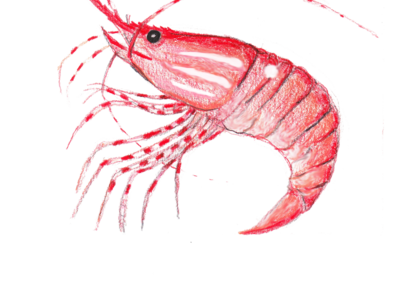 Culinary Tips: Most chefs will not cook spot prawns at all, and will serve them raw referred to as "amaebi" on sushi menus. If you do cook them, keep the preparation simple and cook them quickly to keep their buttery sweet flavor. Sustainability: Traps produce little bycatch, and the areas with sensitive marine habitat or whale migrations that might get entangled in traps are highly regulated. This is a relatively small fishery in terms of volume, so overfishing is not likely to be happening. Also known as California flounder, half the population of starry flounder is right-eyed and the other half is left-eyed. Much like chameleons and other species, they can change coloration to blend in with their surroundings, making them practically invisible to avoid predators. Yet they succumb to the appetites of marine mammals such as sea lions and seals. They feed primarily on zooplankton, small fish and crustaceans, amphipods, and copepods. 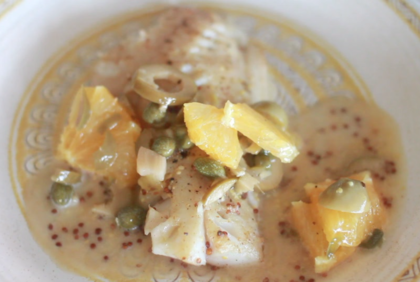 Culinary Tips: Starry flounder are best prepared in a recipe calling for dover sole or petrale sole. They delicate texture and mild flavor are ideal for broiling, pan frying, or gently sauteeing in a meuniere recipe. 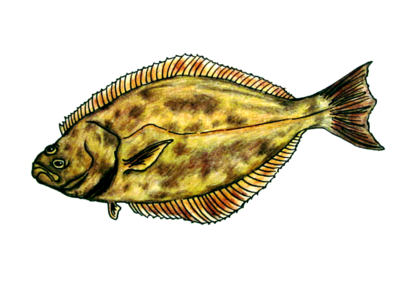 Sustainability: Starry flounder is another well-managed species in the West Coast Groundfish Fishery. Overfishing is not occuring in party because this species is not in high demand commercially. Gear modifications on bottom trawls minimize habitat disruption that is sometimes an issue with this gear type. These species have many aliases: idiot fish, channel rockfish, fagiano ("pheasant" in Italian), bonehead, channel cod, gurnard, gurnet, hardhead, hooligan, lobe-finned rockfish, roundfin rockfish, scorpion, slim thornhead, and spinycheeked rockfish. 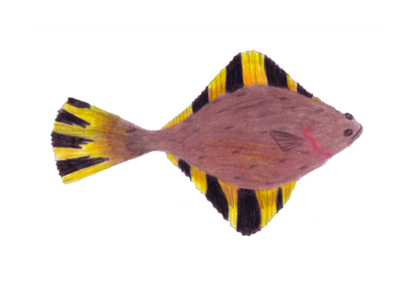 Thornyhead are particularly interesting because they have adapted to the deep “oxygen minimum” layer of the ocean where most fish cannot thrive. They have huge heads, both long and wide, housing very large gills. Thornyheads do not have swim bladders and are fairly hardy, which means unlike many other species that are brought up from the depths, they can be kept alive for live fish markets or released after capture with a much higher survival rate. Culinary Tips: Thornyheads are closely related to rockfish, so they are just as versatile and can be substituted for any rockfish recipes. Due to their small size and big heads, they are best prepared whole, roasted, steamed or fried, and eaten off the bone to maximize yield and flavor. Sustainability: NOAA fisheries did an assessment in 2013 that found thornyhead stocks to be healthy. 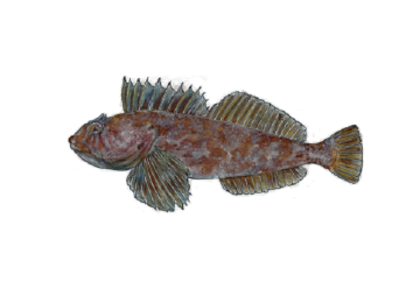 All thorny heads are well managed under the West Coast Groundfish Fishery. 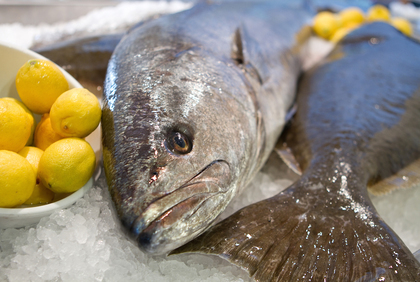 The white seabass, also known as white weakfish or king croaker, is not a seabass at all. It is a member of the croaker family, and it is the largest croaker in the Pacific Ocean. This species can exceed 20 pounds (only in California), with the largest recorded specimen reaching over 5 feet long and 93.1 pounds. They feed primarily on anchovies, sardines, and squid. Some adults have been found to have eaten nothing but Pacific mackerel, a strong tasting fish often used in sushi. This is an infamous fish in the recreational spear-fishing community in southern California. They are a rare find and tend to prefer deeper, murkier waters. Spearing a white seabass is considered quite an accomplishment. 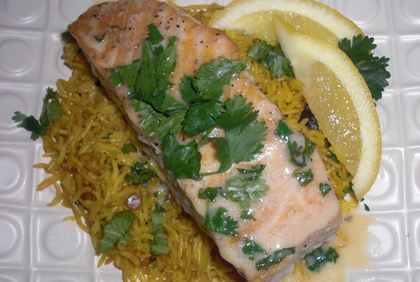 Culinary Tips: White seabass is a versatile fish that is great over the grill with simple seasoning. It can become a bit dry if overcooked though, so marinades are perfect for this species. Sustainability: The white sea bass population has recovered from heavier fishing pressure in the past. Today the population along the central coast of California and in Monterey Bay is believed to be healthy. When caught with hook and line, bycatch is very low. Mediterranean mussels, also called blue mussels or sometimes black mussels, are a very common species of mussel for mariculture production all over the world. Our variety are called Hope Ranch mussels and a farmed by the Santa Barbara Mariculture Farm outside Santa Barbara, CA. The farm utilizes a rope-culture style of mariculture typically seen in New Zealand mussel farms but adapted for the southern California climate. As with other bivalves like oysters and clams, mussels are filter feeders that clean the surrounding marine habitat and promote a healthy ecosystem. Mussels are also one the healthier with 20 grams of protein per 3-ounce serving, and only 146 calories. Most of the fat are heart-healthy unsaturated fats, and they also include a number of key vitamins and minerals. Culinary Tips: Mussels are best when steamed with some white wine, beer, or vermouth. Only cook mussels that are closed tightly before cooking, and only eat mussels that open on their own after the cooking is finished. Sustainability: Mussels farms improve the water quality in their surrounding environment, making them one of the most sustainable seafood species on the market. Grenadiers, also sometimes called "rattails", have large heads, large eyes, and long slender black bodies perfectly designed for the deep waters they inhabit. They are caught by accident as bycatch from the black cod vessels we work with, and historically they were tossed overboard because no market existed for this species. This isn't the most handsome fish species, but grenadier fillets are a lovely light pink color similar to rockfish but with a more cod-like shape. It is the primary species for our Bay2Tray program and has been a hit with our school partners across California. Culinary Tips: When it's fresh and handled properly grenadier is a fantastic substitute for any fried fish preparation, or any recipe calling for cod. Our favorite preparation is for fish tacos! 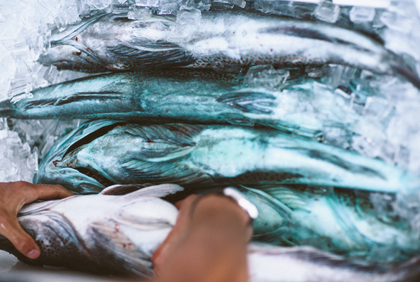 Sustainability: This is a new and growing commercial fishery so the status of the stock is unknown, but "overfishing is unlikely" (Seafood Watch). Our grenadier is always bycatch from sustainable black cod fishery participants, so we always feel comfortable promoting it. It is also great providing value to our fishing partners for these unintended species. Longnose skate is a species of ray that lives in the north-eastern Pacific ocean from the Aleutian Islands to Baja California. This species is rarely seen in commerical landings south of Point Conception, however. Skate spend most of their lives buried in sandy bottom seafloor habitat up to their eyes, patiently waiting for their prey and avoidng predators of their own. Skate are closely related to sharks, and like sharks they don't actually have any bones, just hardened cartiladge. Culinary Tips: Don't be daunted by skate's odd appearance, it is easy to cook, mild tasting, and has been a French staple forever. Treat it like a sole or flounder fillet, so gently baking or pan-frying in browned butter with a lemon caper sauce, are perfect preparations. 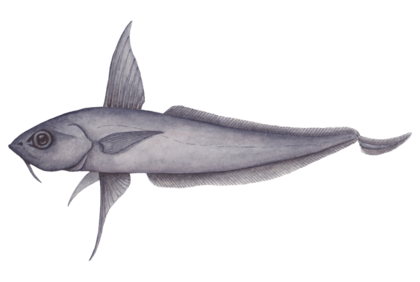 Sustainabiltiy: The longnose skate we source is typically bycatch from sustainable rockfish fisheries, or from the California Halibut fishery (rated as Best Choice and Good Alternative, resepctively). The longnose skate fishery itself is abundant and management is considered effective.